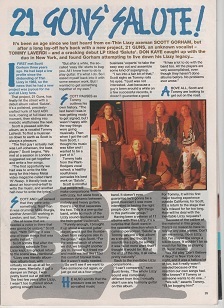 21 Guns is a melodic hard rock band formed in the early 1990s by Thin Lizzy's guitarist Scott Gorham, bass player Leif Johanson and drummer Mike Sturgis who met through their work with Tom Galley's and Wilfried Rimensberger's “Phenomena”. At the time the band was fronted by vocalist Tommy La Verdi, formerly of the band A440. A440 enjoyed mediocre success with songs such as "Method to my Madness" and "Flair for the Dramatic". He was replaced for the second CD by former Sons of Angels singer Hans-Olav Solli. The band was dissolved in 2000 but Scott and Leif joined forces again in 2008 and started to work on a new album and are planning some live concerts.